Located in the popular Shearwater Estate, this immaculate property is beautifully designed and ready for you to move straight in and enjoy. The home features a master bedroom at the front of the property, with views through the extensive windows over the immaculate garden, and with the added comfort of an en-suite and walk through robe. 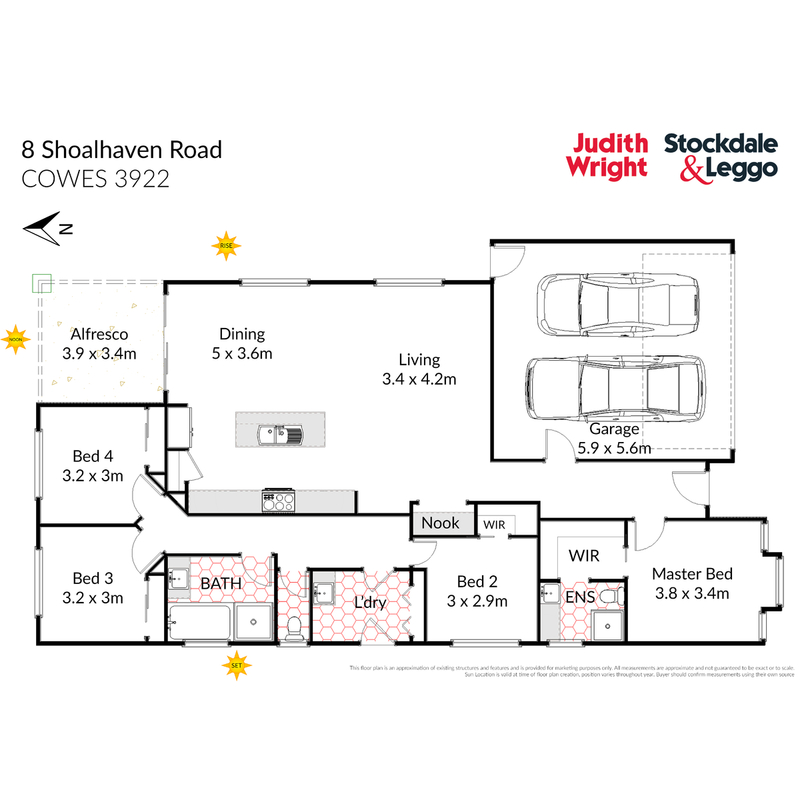 A further 3 bedrooms, all with built in robes, surround a stylish central bathroom with large shower and comfortable bath, separate toilet and laundry with inbuilt storage. The generous kitchen features stone benchtops, stainless steel appliances, electric cooktop and wide wall oven. The kitchen adjoins the spacious open plan living and dining room with an inbuilt study nook, wired and ready to connect with the NBN. The home offers full security alarm, solar panels, split system heating and cooling, and is internet ready. The property offers a secure, fully fenced north facing rear yard with timber decking and alfresco area, ideal for outdoor dining and entertaining. A double remote controlled garage ensures secure parking for vehicles and offers direct access to the home. With low maintenance landscaping, this property is perfectly deigned for the busy family, weekend enjoyment or investment. Situated in close proximity to the golf course, Silverleaves Beach and shopping precinct, Shearwater Estate is renowned for its natural surrounds including picturesque lakes, parklands and open spaces, all of which are within a leisurely stroll from this impressive home. Arrange your private inspection today.